By:Jeffery C. Huff and Brian G. Burton, Ed.D. Covers the full pipeline of game development using the Unity 3D game engine. In this second textbook of the E.G.G. (Entire Graphic & Game) series, Professors Jeff Huff & Brian Burton (co-creators of a very successful game development degree at the University level) show how to create a simple physics based game from design, to 3D modeling with 3DS Max, to texturing with Photoshop, and developing the game in Unity 3D (v.4), finally publishing for iOS, Android, Blackberry, and Windows 8 mobile devices. 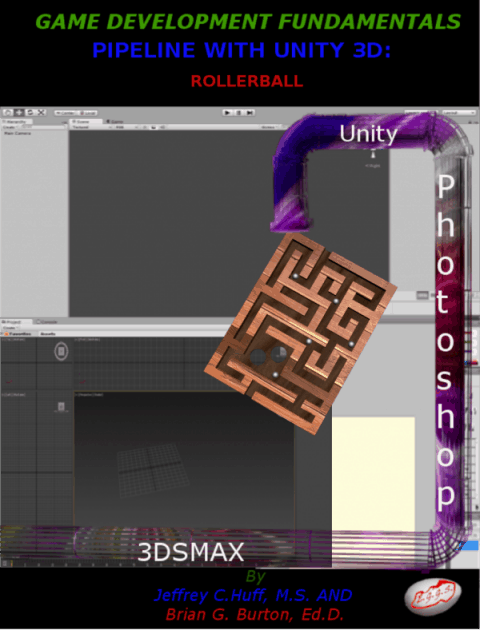 In this textbook, you will learn to make a rollerball/labyrinth style game. Students will learn to design, model, texture, import, program, modify for mobile devices, and publish the game. This textbook builds upon the knowledge gained from the previous Game Development Fundamentals Pipeline textbook and continues the developmental process in creating a slightly more complex game. Approximated development time in a college course: 4 to 7 weeks. v1.02 – Clarification on how to make CameraPivot a child of the ball in chapter 7.
v1.01 – Added a cube to Ch. 6 to keep the ball from rolling out at the beginning.